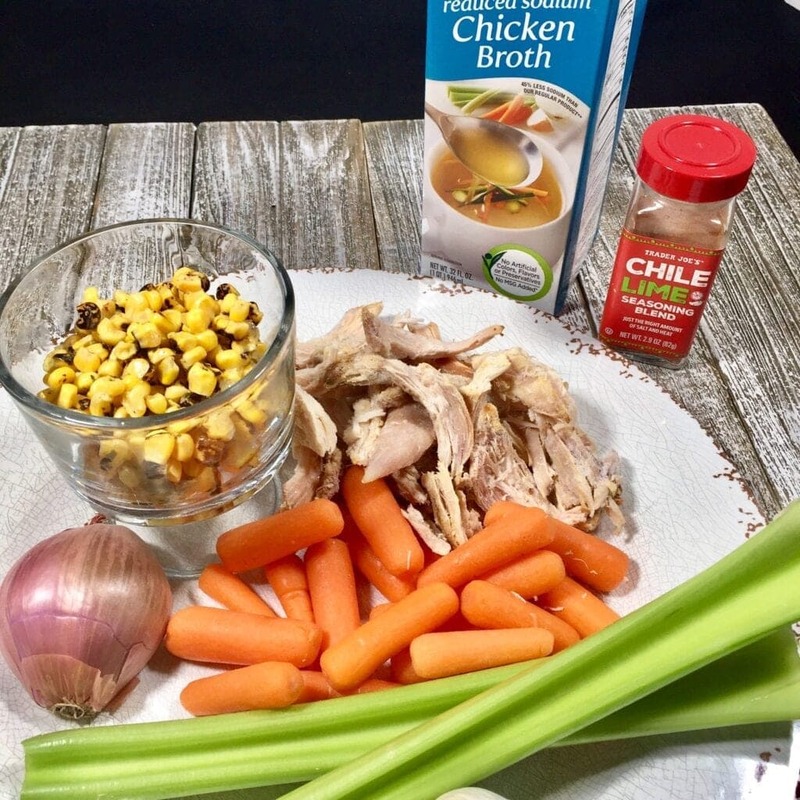 Mexican Street Corn Soup brings out the true flavors of Mexico – roasted corn, cotija cheese, chile peppers, limes and chicken. I really love this Mexican Street Corn Soup for so many reasons. First and most importantly, it’s incredibly delicious because it’s loaded with so many layers of flavors. 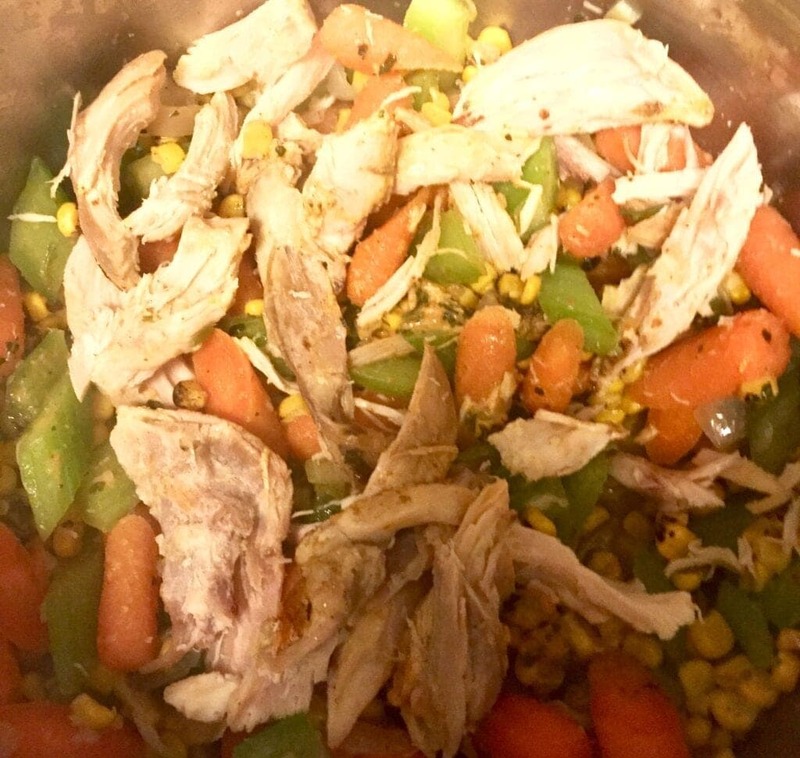 Next, it’s super easy to cook because this recipe calls for already roasted corn as well as cooked rotisserie chicken. Then too, with the addition of lots of fresh vegetables, it’s also very healthy for you. Finally, it’s rich, hearty and a full meal deal. It’s a perfect dinner all by itself and it’s totally ready to serve in about 35 minutes. And when you’re working all day long, that’s really a blessing. Cotija Cheese: Fabulous Mexican Cheese that actually comes inside the roasted corn package. First, add a little olive oil to a large pot over medium high heat. Then add diced onions, celery and carrots and sauté them 3-4 minutes, until they just begin to caramelize. Then add the minced garlic and cook about a minute more. You don’t want to add the garlic earlier when you add the other vegetables, because garlic burns very easily, just about a minute is all it needs. Then add in the frozen roasted corn along with the shredded chicken, chicken broth, Smoked Paprika and Chile Lime Seasoning. At this point, you’re almost done. Just turn the heat to low and let all those flavors simmer together for about 30 minutes. 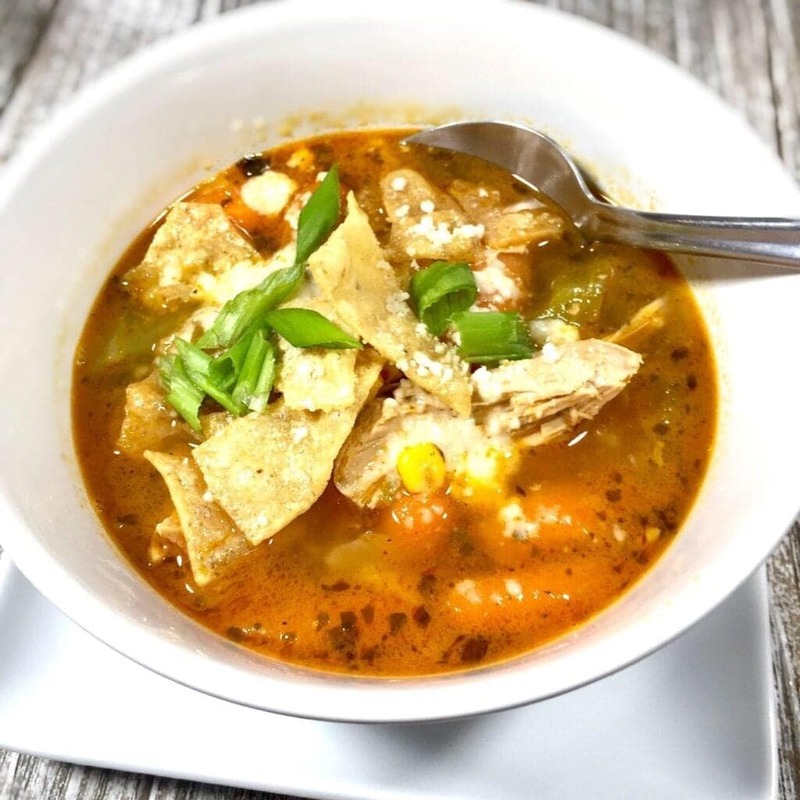 When it’s time to serve, ladle the soup into bowl and top it with crushed tortilla chips and Cotija cheese. This Mexican Street Corn Soup was inspired from the delicious corn that they sell on the streets of Mexico. Fresh steamed corn is slathered in mayonnaise then coated with Chile’s and cotija cheese. People line up for it. Check out this recipe from Isabeleats. Yes, I know. I seem to be a walking advertisement for Trader Joe’s. But I can’t help it. There’s just too many good things in that store. Like, for instance, you can buy fresh Mirepoix already cut up for you. I didn’t use that Mirepoix for this recipe, but if you’re running behind, it’s certainly a time saver. It’s fresh, it’s wonderful and it’s done. The Chile Lime Seasoning has been a staple in my pantry for a long time now and I’ve used it in several of my recipes. With the first taste it’s lime forward, and then you taste the Chile. Totally fresh tasting. It’s really a perfect blend. And the Mexican Style Roasted Corn is sheer genius. I’ve roasted my own corn for other recipes and I have to say, this is awfully close in taste. Plus, cotija cheese is not easy to find and bless their hearts, Trader Joe’s included 2 packages in each bag. For those who have no Trader Joe’s near, you can make some substitutions here. Instead of Chile Lime Powder, I would use Chile powder, salt and a good squeeze of fresh lime. And in place of the Mexican Style Roasted Corn, you can saute regular corn kernels over medium high heat for 3-4 minutes until it just begins to char. Then add additional chile. For the Cotija, you can use feta cheese in place of soft Cotija, and for the aged Cotija, Parmesan or Romano would be a good substitute. 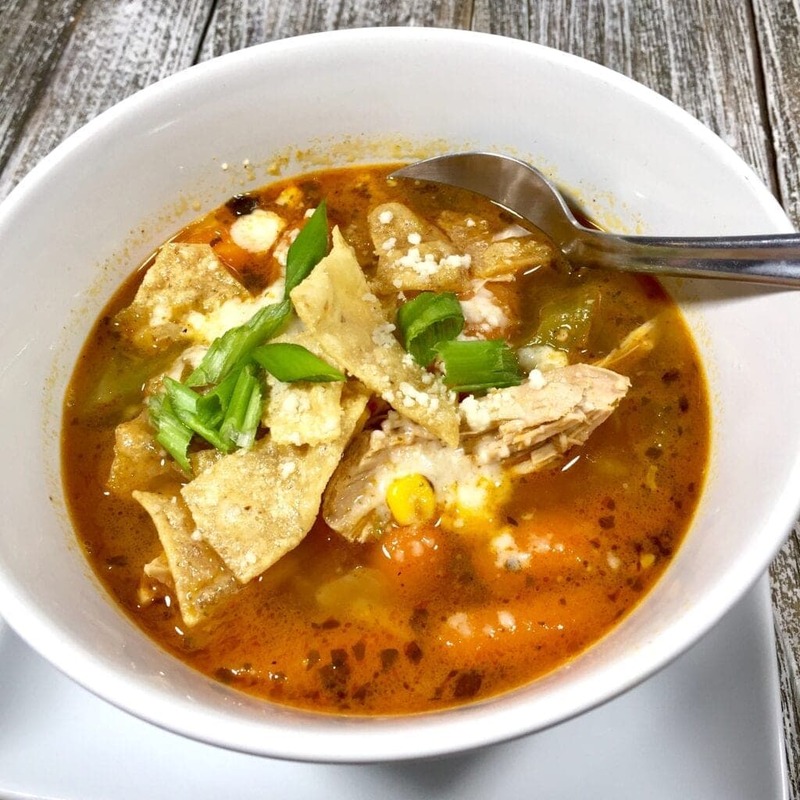 Mexican Street Corn Soup brings out the true flavors of Mexico - roasted corn, cotija cheese, chile peppers, limes and chicken. Add olive oil to a large pot over medium high heat. 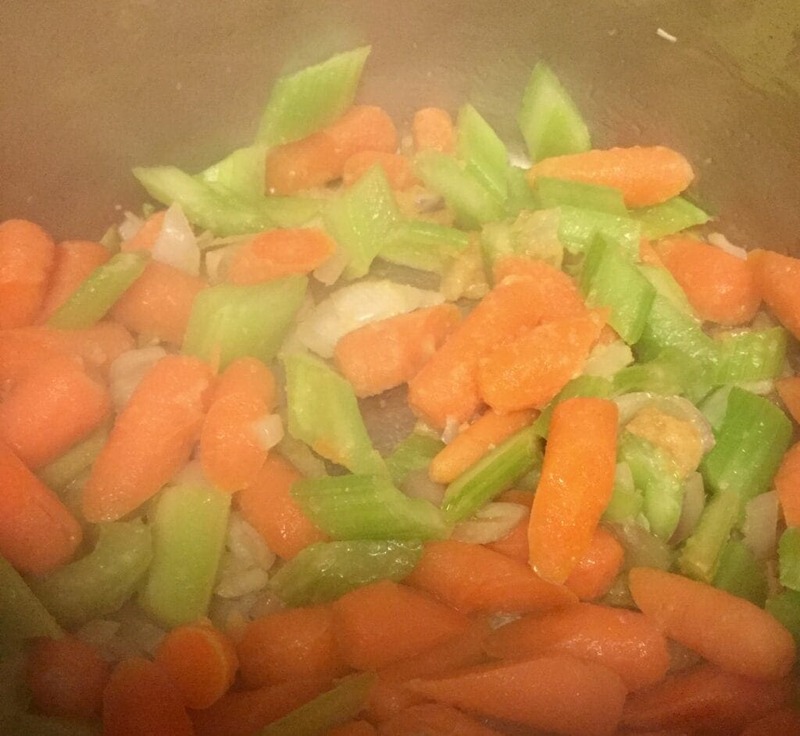 Then add diced shallots, celery and carrots and cook 3-4 minutes, stirring constantly until slightly caramelized. Add minced garlic and cook 1 minute longer. 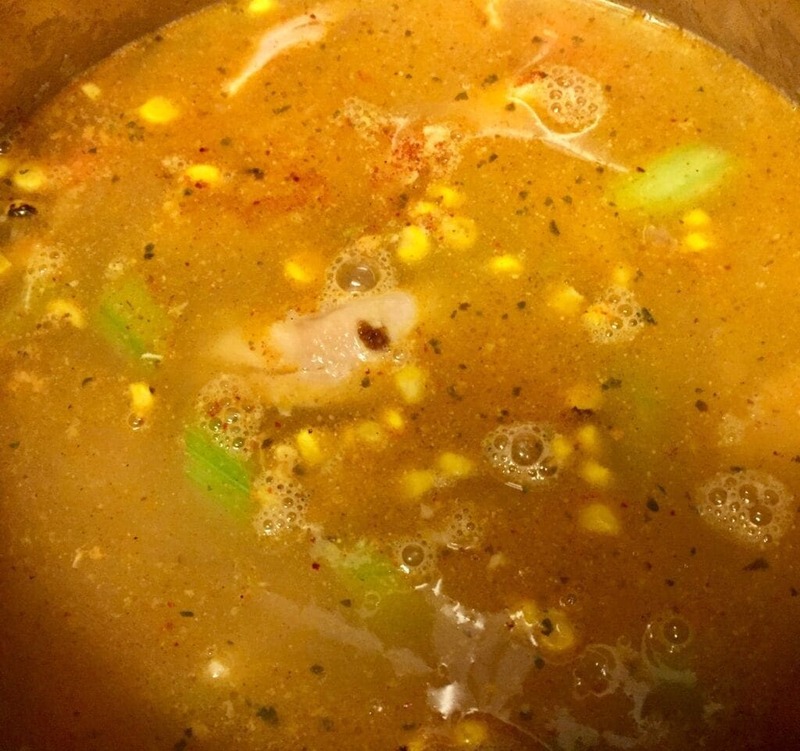 Then add roasted corn kernels, chicken, chicken broth, Chile Lime Seasoning and Smoked Paprika. Turn heat to low and let it simmer 30 minutes. 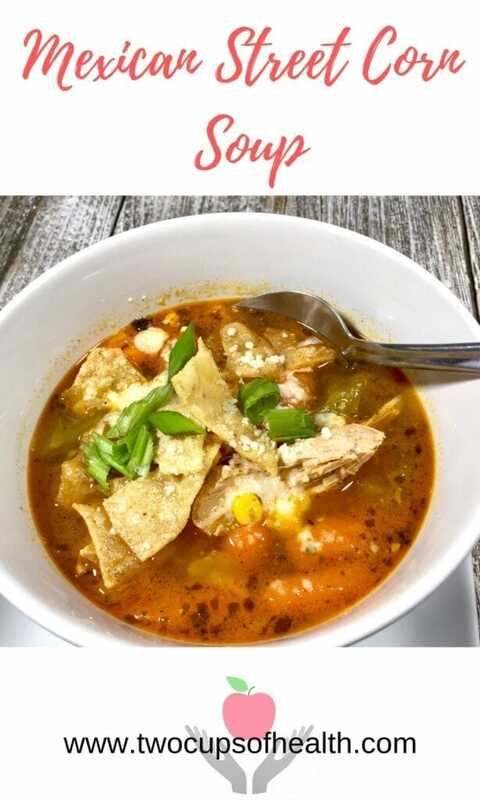 Ladle into bowls, top with tortilla chips and cotija cheese and serve. If you like this recipe, please leave a rating and comment below and be sure to pin this on Pinterest!